Winter squash facts, an information sheet for kids cooking activities. 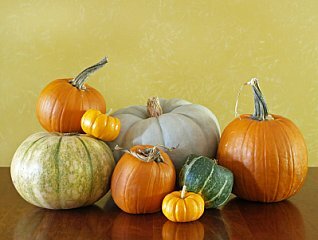 Winter Squash facts and general information about winter squash. Winter squash are available fall through winter season. From a seed planted in late spring. Choose a squash that is heavy with a thick hard shell. No spots, mold, bruises or cuts should be seen. Store in a cool dark dry place. If cut in half store in fridge covered with plastic wrap. 1 serving equals about 1 cup cubed. Squash with darker orange flesh are more nutritious. 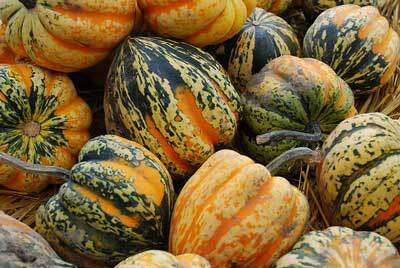 Winter squash is high in Vitamin A, Vitamin C and dietary fiber and potassium. Toss with 1/4 Cup or less olive oil. Season with salt and pepper. Sprinkle with Parmesan cheese. Serve. Make your favorite Sloppy Joe recipe and stuff an acorn squash. Cut squash in half and remove seeds. Cook in boiling water about 10 minutes. Place on serving dish. Prepare sloppy joe recipe and stuff squash with mixture. You can also sprinkle with bread crumbs and cheese and broil on baking sheet 2-3 minutes until cheese melts. 1 medium squash cut in half or wedges and cook in oven for 1 hour or until tender. Allow to cool and scoop out flesh from skin. Stir in squash. Add 4 Cups chicken broth. Simmer for 20 minutes. Puree in blender. Serve. ~~Try butternut squash or pumpkin for this recipe. Add cubed or julienned squash to soups, stir fry, pot pies. 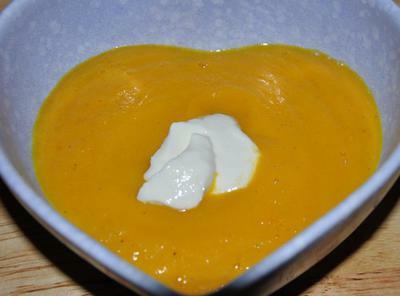 Make cooked butternut squash into a cream soup. Add ½ cup pureed cooked squash to pancake or waffle batter. Stuff squash with chopped apples and bread stuffing such as stove top or a homemade version. Cube squash and roast in the oven with Brussels sprouts, carrots or other vegetables. Drizzle all vegetables with olive oil and season with salt and pepper. Bake at 375 degrees until tender. Back to Food Facts from Winter Squash Facts.